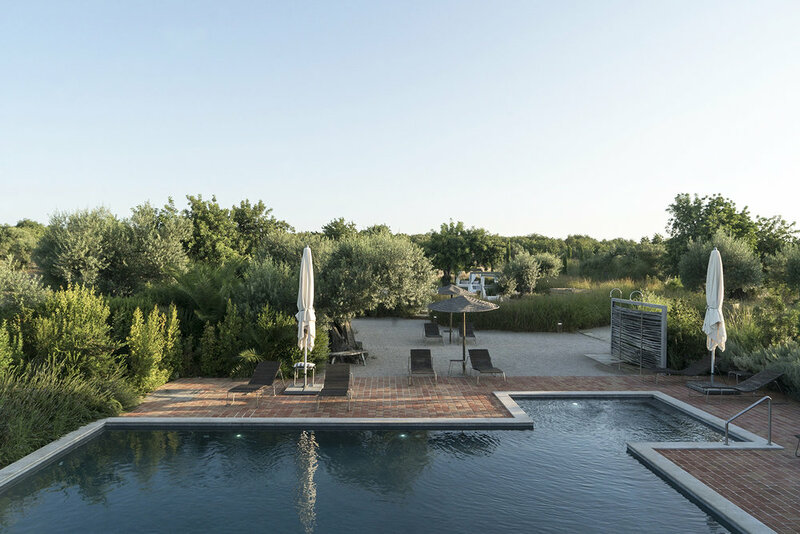 Lovingly and painstakingly restored over 6 years by ex-Londoners Hallie and Tim Robinson, the 19th Century Portuguese Country House was converted into a beautiful 15-suite rural hideaway in the heart of the Eastern Algarve. Away from the busy resorts, this tranquil retreat is surrounded by 10 hectares of almond, carob and olive orchards, in addition to vegetable and herb gardens, all of which are used for the on-site restaurant. The rooms are a lovely mix of exotic pieces from the owners’ travels alongside design classics like Eames chairs, with most rooms having a private swathe of garden or terrace to enjoy the spectacular surroundings. Ideally located close to the beaches and quaint towns but far enough away to escape the crowds, Fazenda Nova is the perfect place to unwind and recharge after a day of exploring. With an onsite restaurant serving fresh local and homegrown foods, a glorious saltwater pool to cool off in, and lush gardens and winding pathways with endless restful nooks, there may be no need to actually leave this luxurious eco-retreat at all! There are 15 beautiful rooms and suites located within the main house and dotted around the garden. The 8 Garden Suites are bright and spacious and feature king size Balinese beds with ensuite bathrooms, rain showers and their own private garden or terrace. The two Apartments can be interconnected for larger groups or families and feature an open plan living area with a kitchenette, wooden Balinese style queen beds and a private garden area. The first floor terrace suite features a large private terrace with stunning views, sunloungers, a seating area and firepit in addition to a king size bed. 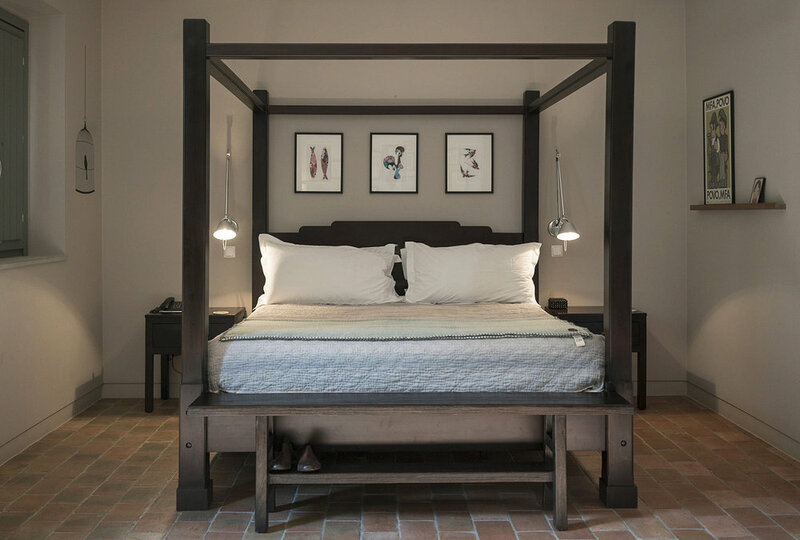 The 3 Loft Suites are designed with an urban edge and are located in the main building. The Master Suite is truly the perfect hideaway with an indoor space featuring a dining area, lounge with dual sided fireplace, bedroom and bathroom, and a private outdoor space with a jacuzzi and outdoor shower and views that extend to the sea. All rooms feature hypnos mattresses, Egyptian cotton sheets, luxurious bedding, an iPod dock, Lavazza coffee machine, flat-screen TV/satellite/DVD, AC, wifi and lovely Ren toiletries. The Hotel restaurant, A Cozinha, is for hotel guests only and offers a daily menu of modernized traditional Portugese dishes for lunch and dinner, made with local ingredients. The restaurant is closed Saturdays, but there are plenty of neighboring restaurants to explore. During Family weeks, the menu also includes kid friendly dishes. The European-style breakfast is a selection of fresh fruit, freshly-baked breads, juices, pastries, cereals, cold meats and cheese. Eco-friendly - The hotel grows its own fruit, herbs, vegetables, olives and almonds, and sources all other food locally, and has a creative approach to recycling: tables and headboards were made from the building’s original shutters and outdoor furniture was made from a 100-year-old pine on the property. Organic waste is composted or shredded for use on the hotel’s orchards and vegetable gardens, and water is treated on-site to be reused. The closest airport is Faro, about 25mins form the hotel. Fazenda Nova is adult-only for most of the year, however children under 14 are allowed during a few set weeks in school holidays. Baby cots and additional beds are available for all rooms. One garden suite has wide doorways and an ensuite bathroom adapted for wheelchair users; all rooms are on the ground floor, and there are ramps for entry at both the front and back of the house. We strongly recommend hiring a car to visit beaches and other nearby towns, restaurants and attractions. The things to do in the Algarve is endless, from hiking, to cycling, watersports, local markets, to spending the day at the beach. Praia de Fuseta is a sandy beach just 10 minutes away and is less touristy. From there, you can take a 5 minute ferry to a tiny island, Ilha de Fuseta, which is even less touristy. Another small island, Ilha de Tavira, has a 14km stretch of white sand beach that resembles the beaches of the Caribbean! Olhao is a small fishing port packed with Moorish-style houses with plenty of welcoming bars, restaurants and market halls. For information or booking visit their website and instagram.